Earlier this evening I ran the water in the sink in the upstairs bathroom and by the time the water was warm, the sink had nearly filled up. Then, when I went downstairs a while later, I heard a dripping noise. I thought it was water dripping into the fireplace from the chimney because it was raining outside, but it wasn't. It was water dripping in from the ceiling below the upstairs bathroom. I guess we need to deal with this bathroom before the remodel. Sigh. And with the rain, we've now confirmed the roof over the driveway is leaking. So we also need to deal with that roof problem. It may already be too late to bother because who knows how many years it has been leaking. That wood may very well be so rotted it will have to be replaced. More fun. On the remodel front, Jeff and I went shopping yesterday evening and he picked out his stove; a BlueStar RNB. So now we have chosen the major kitchen appliances. We're not sure if we'll get the oven in black or this bottle green. They actually offer 190 different colors; it will be tempting to see if we can match it to our backsplash tile or mosaic. We're also going with the Miele Diamante fully integrated dishwasher and the Subzero fully integrated refrigerator. 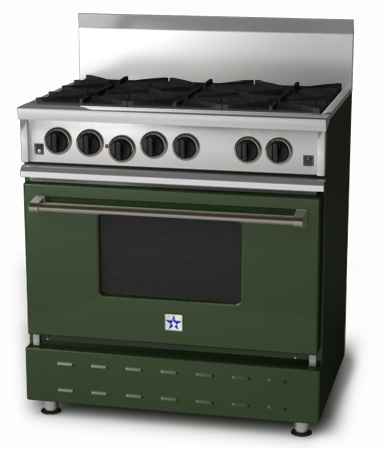 (Fully integrated means we'll be able to add a wood panel to the front of both appliances). Even though it's going to be a while before demo starts, the remodel is starting to feel real. I think I'm going to like having the 22,000 BTU burners. It will be nice to have a convection oven again.